The robotic series LidR1 and LidR2 apply flip top open lids on wrapped wet-wipe or moist-wipe packages off-line. These units are equipped with visual control systems to assure the correct position of the lid to a tolerance of ±1 mm aligned with the label. The use of the visual control system to detect position and orientation, on both label and lid on every cycle, makes the system very efficient by allowing packs to be processed even if not perfectly aligned. Products are fed into the lid applicator in any facing up position, single or twin file. The capacity of our lid applicators start at 75 ppm (packs per minute), and we count with applicators up to 200 ppm. In order for the machines to work properly and guarantee an efficient operation, the production, the packs and the lids, must count with some minimum requirements. The machines count with hand fed multiple vertical magazines of plastic lids. When fully loaded, each magazine can hold up to 200 lids, this gives the machine an autonomy of lids of up to 5 minutes (dependant on the characteristics of the lids), and we count with systems to increase the autonomy for up to 40 minutes. The hot-melt glue tank is manually filled by an operator, which is accessible from ground level and in the standard version has an autonomy of about 2,5 hours, autonomy depends of the design and size of the lids and type of glue, and with a unique control of the glue, saving our clients money and increasing up-time. The reject system rejects defective packs or those which do not count with properly applied lids. Our lid applicators are able to detect a wide range of defects, please contact for further information. The machine discharges good packs with lids onto the client’s conveyor, in the same orientation as the infeed, with long axis parallel to direction of travel. 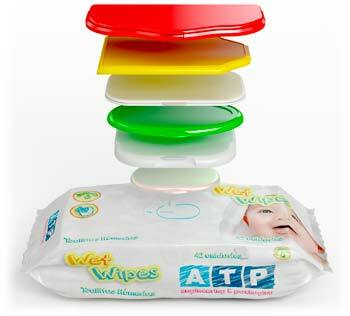 The first wet wipes (moist wipes) appeared in the market in the 1970s. Today, most of the wet wipes are packed in flow wrapped bags, which usually counts with a re-closable lid or label, for opening the pack, extraction of a single wipe and closing of the pack to avoid de-hydration. Was founded in 1996 and its activity is focused in the packaging sector, supplying machines and fully automatic complete packaging and case packing lines.